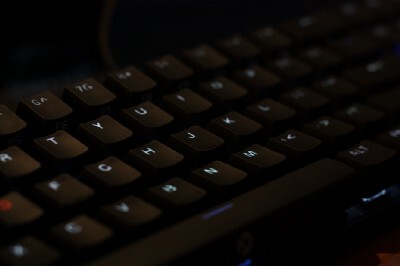 My requirements for mechanical keyboards are generally quite loose: each of my keystrokes needs to echo throughout my hallways like a strike from the hammer of Thor, and it needs to be able to connect to my PC at least over USB. So yeah, not too a list too hard to hit. 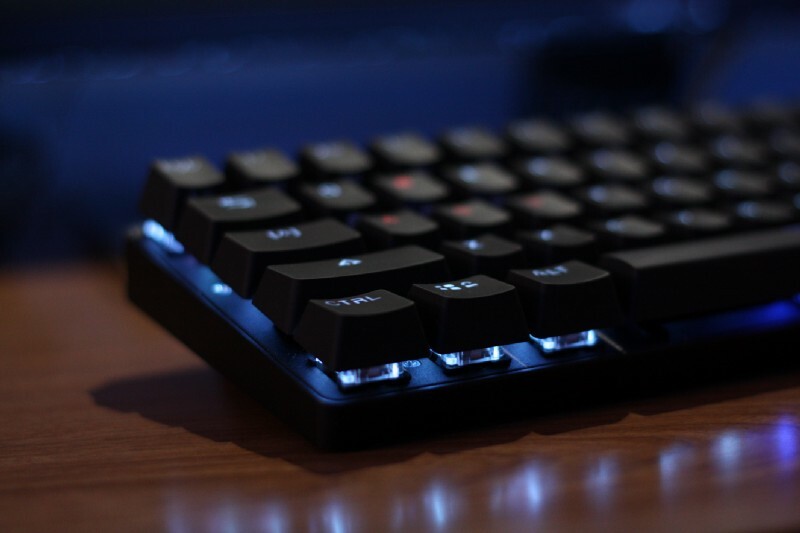 But you know, DREVO has much higher standards than me, so they packed a TKL keyboard with per-key RGB back-lighting, Bluetooth 4.0, mapable keys, programmable macros, and more. You can find the DREVO Calibur on Amazon and Drevo’s official website. Drevo really nailed it with their packaging. The keyboard was safely tucked between two thick slabs of foam with a hard plastic guard, shaped to the keycaps, on the top. It would take something extreme to damage the keyboard while it’s in there. Battery life was really good with Calibur. I don’t know what the max use length is, but it’s definitely past 5 hours of continuous use. Charging is really convenient too. 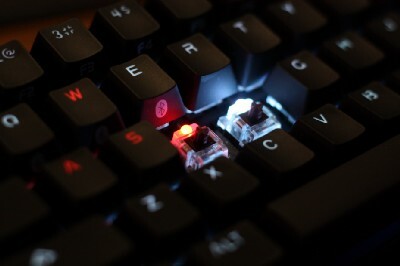 The space key back-light will change its color to indicate when it is charging too. 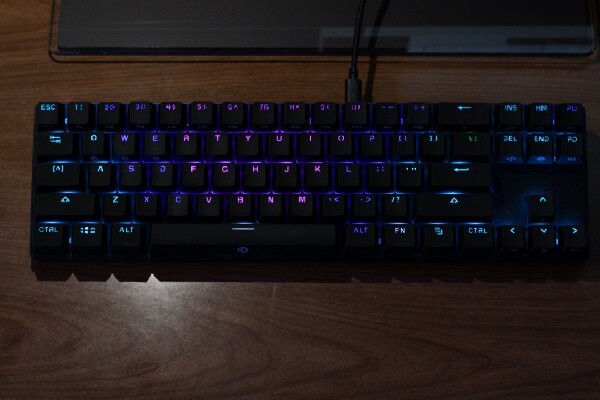 The Calibur also features per-key customizable RGB back-lighting. When setting my own colors I found the RGB to be pretty expressive and relatively accurate. While lighter colors do feel a bit washed out, I don’t think that’s a flaw limited to the Calibur. RGB LEDs in general aren’t too good at such things. As far as setting your own color schemes goes, there’s two layouts available for customization directly accessible from the keyboard. There’s a special mode that lets you set each key to one of seven colors. While the color choices are a bit odd for my taste, it’s not a big deal since I can set my own layout via the accompanying PC software. Speaking of the software, you can also use it to remap any key or assign it a macro. I’ve tested its maximum length and complexity, and the driver seems to sag under computational pressure. Long macros that require timing precision aren’t always reliable too. Some optimization on the software could go a long way (though I’ve heard that Drevo may be working on some custom drivers to add many more features and resolve this issue). Most of my concerns are derived from the construction choices made by Drevo. 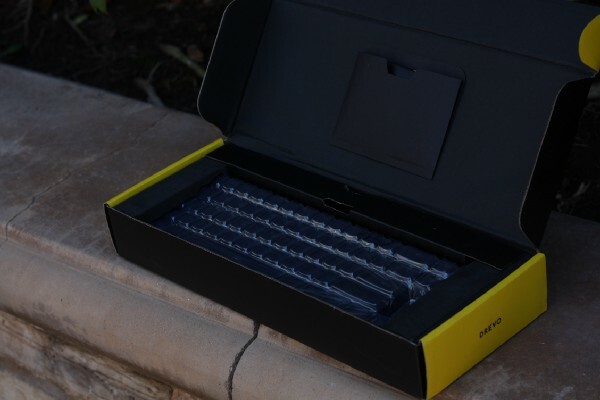 The entire case is made of a relatively thin matte plastic. It looks like ABS mold-injection, though I can’t say for sure. Thankfully there’s no creaking or sagging while typing on it, and the switches are all securely fastened to the PCB. Though, I do find that when using both hands I can flex and torsion my Calibur more than I find acceptable. Beefing up the structural integrity would go a long way to making the Calibur feel more sturdy and solid. 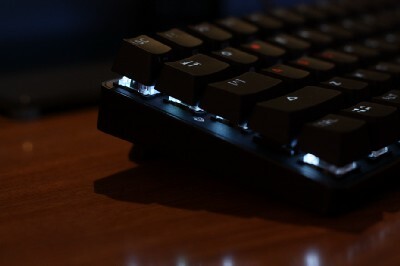 Furthermore, the Calibur makes use of Outemu switches. They feel relatively similar on a tactile level, but they sound inconsistent from key to key. This doesn’t bother me personally, but I know some of my readers are sticklers about these things. For the larger keycaps Drevo chose to go with bar stabilizers rather than stem stabilizers. This is a good choice to cut costs, but did unfortunately result in my unit having a good amount of ping (a faint high-pitched metallic sound that occurs when a key is pressed). Switching to stem stabilizers will help greatly reduce this, and I urge Drevo to switch to them even if it raises the price a couple dollars. Inside the box you’ll find an array of manuals and a keycap puller. It’s not much, but its about as much as I can really expect. 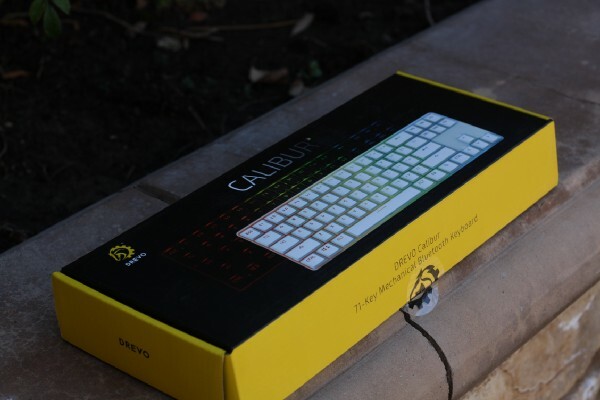 The Calibur represents a phenomenal value in the mechanical keyboard market space. While it could use some sprucing up, I can’t find a more feature-rich and well-built keyboard for the price. Should Drevo choose to release a revised board with Cherry MX switches and stem stabilizers, I’ll be the first one in line to buy it! 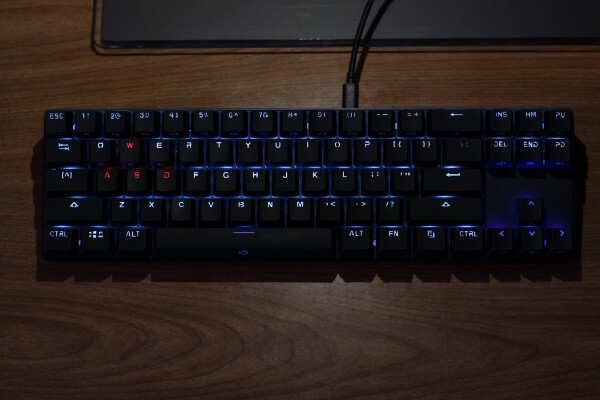 Good job Drevo, and keep stirring up the market!